Silence fell between them, and lingered. Finally Abram spoke. "I'm glad we've never quarreled before," he said. "Because you're a terrifying opponent in a war of words." So he was going to ignore what she had said, and accuse her of simply bandying words. Despair sent tears from her eyes again. She turned her face away from him so he couldn't see. He softened. "I should at least have asked for your side of thing." I have no side of things," said Sarai. "I only want to be left alone while you and Hagar have your baby and go on with your lives." 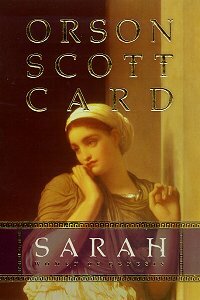 In Sarah, author Orson Scott Card uses his fertile imagination and uncanny insight into human nature to flesh out a unique woman -- one who is beautiful, tough, smart, and resourceful in an era when women get short shrift in life as well as in the historical record. Sarah takes on vivid reality as a woman desirable to kings, a devoted wife, and a faithful follower of the God of Abraham, chosen to experience an incomparable miracle. Set in the splendor and excess of Egypt and the starkly beautiful desert landscapes of the Sinai peninsula, Sarah is an altogether believable and provocative drama. This first novel in a trilogy on the women of Genesis illuminates the hardships and the triumphs of a woman destined for greatness. Sarai was ten years old when she saw him first. She was mistress of the distaff that day, and was proud of the steadiness of her spinning, the even quality of the yarn she drew from the spindle. She had a gift for closing off the outside world, hearing nothing but the words that raced through her own mind, seeing nothing but woolen fibers as she transformed them into yarn. And today she worked with wool of the finest white, for it would be woven undyed into the bridal dress of her sister Qira. Into the yarn, from time to time, she added a red-gold hair plucked from her own head. It would be almost invisible, yet in the sunlight there would be the slightest sheen of color in the dress. Her sister would be embraced by Sarai even as she was given to her husband; a part of Sarai would go with her to the distant places where she would live. A desert man, a wanderer. What was Father thinking? And all because the man was supposed to be of an ancient priestly lineage. "There's power in their blood," Father said. "My grandchildren will have it." As if Father were not the rightful king of Ur, with plenty of godly power in his own blood. The difference was that Father still lived in a city, with many servants around him, while this desert man lived in a tent and surrounded himself with goats and sheep. Let us buy his wool, Father, and pay for it with olive oil, not with the life of my dear sister, my truest friend! As she thought of words she wanted to say, her eyes filled with tears and she had to stop the spindle, lest she mar the yarn through her blindness. Only now, with her spinning stopped, did she notice the flurry of voices at the door. "Then come to the courtyard! My younger daughter will draw you water from the cistern." Father's voice. Which meant that Sarai was the daughter who must draw the water for this visitor. She laid aside distaff, wool, and yarn, and blinked her eyes to clear them. Two feet stood before her, greyish-white with the dust of travel, creased and cracked from the dry air. She had never seen feet so weary-looking. "I'm afraid I've interrupted you," said a voice. A gentle voice, pitched so only she could hear. But also a strong voice, full of confidence. Already she knew that she wanted her name to be spoken by this man, so she could hear the sound of it spoken with such authority and yet such kindness. If the gods could speak, this would be the voice of a god. "Sir," she said, "will you have water from our cistern?" "I would have water from your hands," said the man, "since you are to become my sister." At once the tears leapt back into Sarai's eyes. This must be the desert man, her sister's husband-to-be. She should have known at once, from the feet! Who but a desert wanderer would have feet like these? And he smelled like goats and donkeys! I don't want to see his face, she thought. For what if he is beautiful, so my sister will love him and not be sorry to leave me? And what if he is ugly, and I have to be afraid for her, going off into the desert with a monster? "I will draw water for you, sir." Not looking up, she strode to the cistern -- walking boldly, so he would know she did not fear him, though she would not raise her eyes to see him. She climbed the short ladder and pulled upward on the waterdoor. She could hear water gurgling out of the cistern, splashing down into the jar. It would take muchto wash those feet, so she left the water flowing until she could hear the pitch of the falling water begin to rise, telling her the jar was growing full. Then she put all her weight onto the waterdoor; it slid downward and closed off the flow from the cistern. When she had climbed down, she turned to the jar and, to her surprise, looked the stranger in the face. For instead of standing, he had sat down on the tiles of the courtyard and now looked, smiling, up into her eyes. "You're so serious at your task," he said. Was he mocking her? "I'm not serious when I play," she said, "but I prefer to work. There's pride in work, when it's done well. And someone gets the use of it." She ladled water out of the jar and poured it over his feet. The dust on his legs turned into black mud, and then into slime. He immediately put his hands right in it, scrubbing away the dirt. Ubudüe, the courtyard servant, at once protested. "Sir, it is for my hands to wash your feet." "Your hands?" asked the man. "They're as clean as the king's dishes. Whereas my hands need washing almost as much as my feet do." "And your face," said Sarai. The words came out of her before she realized how outrageous they were. She blushed. "Ah!" cried the man. "My face! I must be as pretty as a locust." He held out his hands to her. She poured water into his cupped hands, and he splashed it at once on his own face. And again. And again. Only then did he take the linen cloth from Ubudüe's hand and vigorously rub his cheeks and brow. When he pulled the towel away and revealed his face to her, his eyes were crossed and his mouth deformed into a grotesque shape. "Better?" he asked. She couldn't help it. She had to laugh. "A little," she said. He rubbed again with the towel. This time he made a much more threatening face. "Do I need more water?" "I'm not sure it will help." He held out his hands all the same, and she poured more into them, and he washed again, and now when the towel came away, he was grinning. It was the face of a god, his eyes so bright, his smile so warm, his cheek so golden with sunlight. "I see that my sister will do well," said Sarai. She said it politely, but inside, her heart was breaking. Qira will forget me quickly, with this man as her husband. "She will do well," said the man, "and better than you think. For I am not Lot. I'm only Lot's uncle, come with the bride-price for your father, and to help prepare for the wedding. Lot is much better looking." "His uncle?" asked Sarai. "But you're so young. He must be a child." "He's the son of my elder brother Haran. My much elder brother. My late elder brother. Lot grew up in my father's tent, as if he were my own brother. He is my brother, in truth, since my father adopted him -- and more to the point, he's the same age as me. Twenty years in the world our gracious Lord has given us." "I'm ten," said Sarai, wondering even as she said it why she imagined that he would care. "Before your age is doubled I expect I'll be coming back for you." "Why? Have you another nephew?" He laughed at that as if it were the cleverest thing she could have said. She had no idea why. "No more nephews," he said. "But still these two feet, much in need of washing." She poured more water as Father came into the courtyard, followed by servants carrying cups of beer and a basket of bread. "Barley for the traveler," said Father. He took one cup from the servant's hand and gave it to the visitor himself. "If the elder daughter is as pretty as the younger," said the visitor, "my brother Lot will be the happiest man in the world." Sarai was astonished. No one spoke of her as pretty. "Oh, now, don't be getting thoughts," said Father. "The younger is already spoken for." "Before the elder?" asked the visitor. "Spoken for by the goddess Asherah." At once the visitor's face was transformed into a mask of rage. This was no game of making faces with a child, either. "You mean to slay this child?" "Abram!" said Father. "You misunderstand me! She is marked to be a priestess. One daughter of the king's house has always tended a shrine of Asherah." His body relaxed a little, but he was still upset, Sarai could see it. "Even though you live six days upriver from the city where your great-grandfather was once king?" "The duty of kings does not end just because the gods are pleased to let another have our throne. A king is a priest before he is a king, and he still must intercede for his people, even if he no longer rules them. What right would I have to return to the throne of ancient Ur, if I slack in my duty now, with my people under the harsh rule of the Amorite?" Sarai poured another ladle of water over Abram's feet and lower legs. The dark slime was almost gone, and the bronze color of his sunworn skin was visible now. His legs were strong -- this man ran as much as he rode. "You speak the truth," said Abram. "But God does not ask parents to give their children to him. He asks people to give themselves, by their own free choice." "Well," said Father, "it's not as if we're going to force her. But she was god-chosen from her infancy. She sang in the cradle. She danced before she walked." "One can be chosen by God, and yet still marry and raise children. The soul with many children is rich, though there is no bread, and the one without is poor, though there is oil enough to bathe in." This idea struck Sarai like a thunderclap. Who had ever heard such a thing? Marriage was fine, and these princes of the desert had their own sort of prestige. But to be a priestess of Asherah was the highest work of all. She would make music in the temple and sing before the goddess, and minister in her holy name. Yet this man seemed not to understand it. No, he understood -- he simply did not believe it. "Sarai," said Father, "I fear that our visitor is too weary for company right now." "I have spoken too boldly," said Abram. "I did not mean to give offense. But you see, your news came as a surprise to me, for I had already promised Sarai that I would return in ten years to marry her." Sarai dropped the ladle. To marry her? That was what he meant when he said that he'd be coming back? "My daughter is normally graceful," said Father. "But look -- you've made her clumsy. Leave the ladle, Sarai. Go inside with your spinning." Still blushing, Sarai strode to her distaff, gathered up wool and yarn and all, and rushed into the house. But she did not stay indoors -- it was too dark for good work, wasn't it? In moments she was on the roof looking down into the courtyard. Without quite planning it, she found herself positioned so that Father's back was to her and she could see the face of this earnest stranger, this Abram, who had been so furious when he thought that Father meant to slay her in sacrifice to Asherah. It was as if he thought himself fit to judge a god. To judge a king in his own house! Was he joking when he said that he would return to marry me? No matter. Sarai knew her life's work. It had no marriage in it. But such a man as this. Filthy from travel, yes. But there was a light inside him that even the dust of the desert could not hide. Everyone in Ur-of-the-North treated Father with great respect and honor, even though he was a king without a city. But this Abram did not need to have others give him his honor. He carried it within himself. He was more a king, arriving filthy from the desert, than Father was, here in his fine house. The disloyalty of this thought made Sarai blush with shame. She would never speak it aloud. But she would never deny it, either. If the desert is traveled by such men as this, no wonder they are fit husbands for the daughters of kings. Qira was born to be a queen, and this marriage covenant with a desert man was the disaster of her life. When Father returned from the temple of the Lord of the city full of talk about a desert priest named Terah, Qira had to fight to stay awake. Why would Father bore her with talk about some Amorite who claimed a special kinship with Ba'al? It was Sarai who was going to be a priestess. Qira was going to be a queen! So when Father said, "And I want you to marry his heir, Lot, the son of his eldest son," Qira did not quite understand. "Whom?" she asked. "You want me to what?" "Marry him. Terah's grandson, the heir to his great and ancient priesthood. Not to mention the greater portion of his flocks and herds." "Marry him? What city is he king of?" "Not king of any one city. He says that the Ba'al of one city is only a statue that reminds us of the true Lord, who has a true name known only to a few, and written in signs known to none outside the lineage of the true priesthood." Qira could not resist throwing some of Father's own teachings back in his face. "'It's an arrogant man who says that the worship of others is false, and only his own is true.'" Father shook his head. "Daughter, theirs is the lineage of Utnapishtim, who rode above the flood. What is the royalty of a mere city, compared to him who is priest to all the world?" "If they don't live in a city, how are they any better than the wandering Amorites?" "The Amorites are barbarians who raid from the desert and destroy what they cannot conquer. As we know to our sorrow." "What cities has this Terah conquered?" "He is no Amorite, that is my point, Qira. There is no need for him to conquer cities, when he is the chief priest of God in the world!" "Father," said Qira, "with all respect, I must still point out to you that a beggar could say the things this man said to you, and it doesn't make him a king unless there are people somewhere who obey him." Father's face turned red then, and Qira realized that in denigrating this Terah, she had said the unspeakable thing: She had denied that a king without a city could truly be a king. "I did not mean ..." But there was no way she could put a good face on what she had said. "Very well," said Father. "Let me speak no more of priests and kings. Let me speak of money. A real prince, to marry you, would demand a dowry, and we have no dowry for you, living as we do on the gifts of my brother king of Ur-of-the-North. While this Terah is rich in herds, and promises me a very sizeable bride-price for you." "Everyone knows the Amorites trade in slaves," said Qira savagely, "but I never thought you would sell your own daughter to one." "As a slave," said Father coldly, "you wouldn't be worth two shoats, since you do no work and have no skills." "Should I callus my fingers with spinning, like a common woman?" "Your sister is not ashamed." "Sarai is born to be a temple servant. I am born to be consort to a king!" "And I was born to rule a great city," said Father. "We don't always live the life we were born for. Would you rather marry some tradesman who will put you in the house behind his shop and trot you out to show his visitors that he has married royalty?" "Once you decide that my shame can be purchased for money, what difference does it make?" At once she saw that she had goaded Father too far. "Your tongue is enough to drive a man to beat a woman!" shouted Father. But he quickly got control of himself. "If I marry you to Terah's grandson Lot, you will be the wife of a wealthy man with a claim to an ancient priestly lineage. No one will say you married down." "Yes they will," she murmured. "Despite the fame of your beauty and the majesty of my rank," said Faither dryly, "there has been no queue at our door of ruling princes begging for your royal company." Qira burst into tears. "I will not live in a tent!" "Is that all?" said Father. "I'll make that a condition of the wedding -- that you never have to live in a tent. But this is the best marriage I will ever be able to arrange for you." Qira was no fool. She might be bitterly disappointed, but she knew that Father would not lie about such a thing. "I will do my duty," she said miserably. And so it was that she consented to this miserable wedding, wrecking all her hopes, discarding all her dreams. Ever since then, she had wondered: What god was it who hated her so much? Still, for days at a time she had been able to forget what lay in her future. Desert men were unreliable. They changed their minds. They broke their word. Or perhaps her future husband died in battle and would never come for her. Or starved to death out in the deep desert where not even grass could grow. She had all sorts of hopeful fantasies like that. But now the filthy uncle was here, and Father insisted on parading her forth as if he were selling a milk cow. "Wear the scarlet," Father said. Her most precious gown. Well, she would not wear it, not for the mere uncle. What did desert men know of scarlets and other bright and precious colors? Everything was the yellow of grass and sand to them, everything smelled of the hair and dung of animals, and the only music that they knew was mooing and bleating. Scarlet would be wasted on him. If Father was unhappy that she disobeyed, what would he do? Beat her with a stick in front of the uncle? Father could insist on the marriage, but she would show her independence where she could. Qira was not one for submissive obedience, and Father had better remember it. So it was her blue and brown woollen dress that she pulled on over her linen shift, only one step up from what a tradesman's wife might wear. "Qira, what are you doing?" Sarai stood in the door of her room, looking stricken. "Showing proper respect to my uncle-to-be," said Qira, feigning innocence. "He's a desert man -- what will he know?" "He will know," said Sarai. "He's not what you think. He doesn't talk like an Amorite -- his speech is as pure as ours, the speech of Ur the Great. And he's a man of refined senses, I know it -- he'll understand what you mean by this coarse dress." "It is a dress belonging to the daughter of a king," said Qira. "All my clothing is far above his station." Why she was bothering to argue with a ten-year-old was beyond her, anyway. Sarai stood in the doorway, contemplating her. "Yes, after all, I think you're right," said Sarai. Since Sarai never changed her mind easily, Qira grew suspicious. "What do you mean?" "It's good to begin your marriage with honesty, not pretending," said Sarai. "With this dress you'll show him that you're the daughter of a fallen, beggarly house that lives on the gifts of another king. The royal scarlet would be nothing but a sham." "I hate you," said Qira. "Asherah may never forgive Father for giving him such a nasty daughter." "You don't hate me," said Sarai. "You love me because I remind you to do what you already know that you should." "I don't like doing what I should." "Neither do I," said Sarai. "But we both do what we must." Qira burst into tears and embraced her sister, who also wept. But as they clung to each other, Sarai spoke softly. "If your bridegroom is like his uncle, you'll not be cursed by this marriage, you'll be blessed. The uncle is a handsome man, and he speaks like one who is born to rule." She told Qira all about Abram, saying several times that since this was only the uncle, the husband was bound to be even better. But Qira saw the truth behind the words, and she was astonished. "You've fallen in love with the uncle!" she said. Sarai looked startled, then embarrassed. "I like him," said Sarai. "I know all about such 'liking,'" said Qira. "You're all set to keep him in your dreams, I know it from the way you talk!" "The servant of Asherah has only such dreams as the goddess might send." "You aren't bound over to Asherah's service yet." "I'll help you put on the scarlet dress," said Sarai. "You know I'm right. That's why you change the subject." "I know that the uncle is waiting, and Father is impatient to show you off to him." "Ten years old, but you have a woman's heart." "It would do me no good to love him," said Sarai. "You know that if one who is intended for Asherah should turn away and marry a man, the goddess will never give her children as long as she lives." "So I've heard," said Qira. "They say such things to keep temple-bound girls from wishing for a wedding. But who knows if it is true?" "I don't intend to find out," said Sarai. "And yet you will dream." Qira began to hum and sing a wordless melody as she held out the voluminous skirt of the scarlet dress and turned and turned. Sarai could not help laughing. "You are such a foolish child," she said. "The ten-year-old says this to her almost-married sister?" "You're a dreamer," said Sarai. "So you think everyone dreams." "You're telling me you don't? I won't believe it." "I'm a very practical person," said Sarai. "I keep my hands busy with work. I keep my thoughts on what my hands are doing." "And you speak nonsense all day long." "Come now," said Sarai. "Father's waiting." "Down to earth," said Qira. "Practical. Handy. What a sturdy wife you'd make for a desert man." "Don't say any such thing in front of him," said Sarai, suddenly angry. "Don't you dare shame me like a little child who has no feelings!" "But you are a little child," Qira teased. "And you just said that you had no feelings for this desert uncle." The fury in Sarai's face would have been frightening, if she were not so small. "If you mock me in front of him I will never forgive you!" "I do what I want," said Qira, and she flounced on out of the room, Sarai scampering furiously at her heels. Sarai knew that Qira would do it, and she also knew that getting mad at Qira would only make it worse, but it's not like you could stop being angry, it just filled you up and you couldn't think about anything else until you either used up the anger or something else happened to take your mind off it. And Sarai meant what she had said. It was silly of her to care what this desert man thought of her, but she did care, and even though she knew he was only teasing when he spoke of returning someday to marry her, she could not bear the idea of being made ridiculous in his eyes. For he alone of all adults had treated her, not as some sacred godbound object to be reverenced, and not as some little toy human to be petted and chuckled at and then ignored or sent away, but rather as a person worth talking to. And if he teased her a little, it was flirtatious and not condescending. He didn't tell her what she looked like or ask her what her favorite toy or game might be. He didn't talk about her hair or comment on how adult she sounded when she talked, as if children should talk a separate language. Instead he talked to her. And if Qira spoiled that by reducing her to a child in his eyes, then she would see what it was like to lose a sister. There would be nothing between them from then on. They would be like strangers forever. Sarai's memory was very long. When they got to the courtyard, however, Father and Abram were not alone. A new visitor had arrived, a man in strange clothing that Sarai recognized as Egyptian -- white linens, with more of his body showing than a man would usually let other people see. The Egyptians who visited Ur-of-the-North were like that, flaunting their disdain for local customs. Their clothing was the only true clothing, their language the only true language, their gods the only true gods. Others had to learn their language to do business with them, though in truth Father had told her once that the Egyptians only pretended not to understand the accented Akkadian speech used here, so that others would speak freely in front of them, thinking their secrets would be safe. That was why Father made a habit of speaking the ancient holy language of Sumeria in front of Egyptians, even though few in this city but the priests could speak it fluently. "Suwertu, these are my daughters, the princess Qira and the godchosen Sarai." Even as she knelt before the visitors, Sarai remembered that Suwertu was the name of the priest of Pharaoh who dwelt here in Ur-of-the-North. He was not actually born Egyptian. He had been a priest of Elkenah until the day he won his appointment as the priest of Pharaoh for this region. Father said he spoke Egyptian with a woeful accent. Officially he merely ministered to the religious needs of Egyptian traders and travelers. In fact, though, he watched over the interests of Pharaoh in the land of the upper Euphrates. These days all the cities of the region had ties to Egypt almost as strong as those of Byblos, which some said was practically an Egyptian city. "Is he a spy, then?" Sarai once asked Father. "Something between a spy, a teacher, and an overseer," Father had answered. "He tells Pharaoh who his friends and enemies are, so that gifts and influence can be used wisely. He encourages the local people to learn Egyptian ways and even give respect to the Egyptian gods. And if there are signs of Ur-of-the-North getting out of line, he will crack the whip." "What whip can he crack, so far from Egypt?" "The Amorites have broken up all the trade routes that used to make this city prosper. You can no longer be sure of carrying goods from here to Ashur or Akkad, to Ur-of-the-South or anywhere beyond the Tarsus. And as for Canaan, the cities of that land are empty, and the people hide in caves for fear of the raids of the Amorites. The only trade that remains strong is between Byblos and Egypt, for that is done by sea, where the Amorites cannot go. So Ur must trade with Byblos if it is to prosper. And if Egypt should tell the king of Byblos that Ur-of-the-North is not a friend to Egypt, will our traders have any part of this trade? That is the whip. It has cracked more than once. There are those who act as if Egypt ruled here. They go to Suwertu to learn the Egyptian language, to worship Egyptian gods, to become Egyptians as best they can." Father said this with disgust, as if becoming Egyptian were as foolish as trying to become a lion or an elephant. And here was this same Suwertu, in the courtyard of their home. What was his business? And why today, of all days, when Abram had come to deliver the bride-price in preparation for the wedding. Despite the presence of the Egyptian, Sarai could see that Qira only had eyes for Abram, and Abram frankly stared at Qira in return. Qira was no doubt trying to guess whether Lot was going to be as handsome as Abram -- or was she noticing only the dirt of traveling that still clung to him here and there? And Abram was probably judging what kind of wife Qira would make, and whether his father Terah had chosen well. But Sarai knew that having Suwertu here had to mean something, and it was unlikely to be coincidence that he was here at this exact moment. For some reason Egypt was taking interest in the marriage of a daughter of the ancient house of Ur with the heir to this priestly family from the desert. Which meant that Terah's claims must have substance -- or at least enough substance to kindle Suwertu's interest. At first the conversation was mere chat -- talking about Qira's charms as if she didn't understand plain speech, telling stories about things that went wrong at weddings in the past, commenting on the bride-price and how Father was going to dispose of such flocks when he had no shepherds among his servants. Finally, though, Sarai's close attention was rewarded, as she heard Suwertu turn to the subject that must have brought him here. "I wondered, though, that a man of such wisdom as yourself, O King, would give such honor to an obscure family of Amorites, no matter how many cattle they brought to your house." Sarai noticed how Abram, rather than growing angry at this insult -- a veiled accusation that his father was a liar -- merely seemed to relax further onto his bench, paying, if anything, less attention to the conversation. "A king is a priest before he is a king," said Father, as he had so often said before. "But not all who call themselves priests have any claim to speak for God," said Suwertu. "There are many gods and many priests," said Father. "There are many names for gods," said Suwertu. "But we all know that the great god whom the people of this land call merely Ba'al, 'the Lord,' is the same as Osiris, the god who dies and is brought back to life by his son Horus with the help of the goddess Isis." "I know little of Egyptian names for the gods," said Father. Sarai could see his wariness increase even as he kept his tone of voice mild. "Terah knows the secret name of Ba'al. And his priesthood comes from Utnapishtim, who rode above the flood, upheld by the hand of the Lord." "But how can he be the rightful possessor of this priesthood, when this can be claimed only by Pharaoh?" At once the air in the room seemed to crackle as if a thunderstorm were about to strike. Abram's eyes were fully closed. "I have never heard such a claim made by a priest of Pharaoh before," said Father. "Who would need to claim what everyone knows, until someone is bold enough to deny it? Out of Canaan came the first Pharaoh. Osiris gave the land of Egypt to him, because only Pharaoh had the true priesthood from the lineage of him you call Utnapishtim." "Forgive me, Suwertu," said Father, "but how could the priesthood of Utnapishtim have anything to do with the land of Egypt, or Pharaohs with Canaan?" It was only then that Abram spoke, though he still did not open his eyes. "Suwertu says many true things. The first Pharaoh was a descendent of a son of Utnapishtim. He did indeed come from Canaan, where his claim to the true priesthood was one of the tools he used in taking control of upper Egypt." Sarai could see how surprised Suwertu was by this admission. "If you admit this, then how can your father claim that his house has the true power of God?" Abram sighed. "My father has many mistaken ideas, I'm afraid. For instance, Ba'al is not just another name for the true God. Once upon a time it may have been so, but now Ba'al is the name for statues erected in every city. The people do not sacrifice to God, they sacrifice to the statue. But my father persists in thinking that these idols can somehow be used in worship by servants of the true God." "So you admit that your father's claims are false," said Father, looking stunned. "That he is of the lineage of Utnapishtim, that the true priesthood is his by right." "Oh, the priesthood is indeed Father's birthright. And the birthright of Lot, through my brother Haran. As long as he is worthy. And I can assure you that Lot is as worthy an heir to that birthright as you're likely to find." Suwertu chuckled. "If this man's father lied about one thing, who is to say he doesn't lie about --"
Abram sat bold upright and swung around to face Suwertu. "My father lied about nothing. I believe him to be mistaken about the relationship between Ba'al and God. I have tried in vain to persuade him to remove all idols from his house. We disagree. But my father is an honest man." "And a pious one," said Suwertu. "While you deny the power of the Ba'al of ... well, of this city." "And every other one," said Abram. "If you deny that Ba'al is God, then you deny the power of the king," said Suwertu. "When the king commands, the priests and the soldiers obey," said Abram. "I'd have to be a fool to deny that." "You deny the priestly power of the king." "In every city, the king rules over the priests. Why would I deny that?" "You deny that the king has divine power." Abram looked startled. "But ... are you saying that kings are gods? I thought they were priests." Sarai finally understood the game that Abram was playing. Suwertu thought that he was examining Abram, but it was really the other way around. Abram was giving Suwertu a long string, and Suwertu was tying himself in knots with it. She smiled. Father glanced at her right then, and winked. He, too, understood. "What is the priesthood," said Suwertu, "if not the power to do what God does." "God does what God does," said Abram. "The priesthood is the power to do what God says for men to do in his name." "I fail to see the distinction," said Suwertu. "But priests and kings offer sacrifice. So they aren't doing what God does, they're doing what God says to do." "Some kings have so much divine power that they do what only God can do." "You mean Pharaoh," said Abram. "I mean that just as Horus went into the underworld and raised his father from dead into spiritual life, so also	does the son of Pharaoh go into the underworld and lift his dead father into heaven. They do what Horus did, and then, as Pharaoh, they will do what Osiris did. The Father and the Son." Abram nodded slowly. "Well, there it is. That's why Egypt is the only place where the story stands on its head. Very clever." "What are you saying?" said Suwertu. "In every other land, we know that the King who dies and is raised up from the dead is the Son, and the one who raises him up is his Father, the God of heaven. Only in Egypt is it the father who dies, and the son who raises him up. For the very good reason that the kings of Egypt wanted to make the claim you just stated -- that they have more divine power than anyone else. Pharaoh has no power to let his son be slain, and then raise him from the dead -- only God can do that. But if you just change the story in this one tiny detail -- have the son raise the father from the dead -- then you can act out the story all you want, generation after generation. The father dies, the son does a ritual descent into the underworld and comes back to report that his father has been raised from death up to eternal life, to dwell among the gods forever. Of course, no one but Pharaoh sees this -- Pharaoh doesn't actually have to produce his resurrected father. That, too, would be very hard to do." Father smiled at Abram's words. Sarai could see that Suwertu didn't like that. "When you think about it," Abram went on, "it's amazing that other kings had never thought of it before. If you don't actually have the power to do what God does, then you simply change the story of what God does, to make it something that you can do. Perhaps those other kings actually believed in God, and therefore were afraid to tell lies about him." Suwertu's loathing was clear, but he maintained his composure. "So you accuse every Pharaoh in the entire history of Egypt of being a liar." "Not at all," said Abram. "I accuse only the first. The rest were simply repeating the story they were taught. Old lies are passed along, not by new liars, but by new fools." Sarai thought Suwertu might burst. But still he contained his hatred. "You yourself said that Pharaoh had the birthright," said Suwertu. "So who are you to say that the story as it is known in Egypt is not the true one?" "I never said Pharaoh had the birthright. I said he was descended from Noah -- the one the Sumerians call Utnapishtim. But through a son who was specifically denied that birthright. Whose children were forbidden to hold the true priesthood. A sad old story, but a true one. The birthright doesn't always follow the lineage." "If the birthright doesn't follow the lineage," said Pharaoh, "what happens to your father's claim?" "The birthright passes from the father to a worthy son." "And how do we know who is worthy? Especially when different sons claim to have the birthright?" "When a man has the true priesthood, the power of God is visible in his life." "But that is what I said before," said Suwertu. "I will believe your father has the priesthood if he can raise his son from the dead, as you say your god can do." "God does not give us his priesthood so we can submit to foolish tests." "Listen to him," said Suwertu, laughing. "He sees now the danger he is in, and so like a rabbit he dodges left and right, trying to avoid the hawk." "I'm in no danger, Suwertu," said Abram. "You're the one who is tempting God." "You are most definitely in danger, Abram," said Suwertu. "In Egypt, when the king dies his son goes to the underworld to bring the king into eternal life, as Horus did for Osiris. If your priesthood is more true than Pharaoh's, you must prove it by doing what you say your God does." "We sacrifice animals as a symbol of the death and resurrection of the Son." "Look at the rabbit dodging," said Suwertu. "Your father pretends to have the kingly priesthood -- to be the only man in the world with the right to that priesthood -- but kings offer kingly blood in sacrifice." "Your Pharaohs die of old age," said Abram. "Not as a sacrifice." "But the son of the king is young. For him to be resurrected, he must be helped to pass over into death." "Don't be ridiculous," said Father, interrupting. "I want Lot as a husband for my daughter, not as a sacrifice." "Lot is Terah's grandson," said Suwertu. "Abram here, this man of effrontery, he is a son of Terah. So let this Abram be offered up in sacrifice, and then let Terah show us he can raise him up. Pharaohs do this every generation. If Terah cannot do as much, then this marriage has nothing to do with kings, and everything to do with sheep." ""Suwertu," said Father, "you pervert the idea of religion." "There are many kingdoms where the king's blood is shed," said Suwertu mildly. "Barbaric ones," said Father. "Or they name a man as king for a day, so they can kill him, and then the real king resumes the throne. I do not require any such foolishness!" "No, but you do require a royal marriage for your daughter," said Suwertu. "I will explain this situation to the King of Ur-of-the-North, your host and benefactor. I think he will agree with me that unless Terah passes this test, his claim to be of royal blood will not be recognized. Then if you marry your daughter to this grandson, this Lot, it will be seen for what it is -- selling your daughter to an Amorite shepherd in exchange for sheep." "Why are you doing this?" said Father. "Why does Egypt care?" "Because Pharaoh is the only king on earth with the true power of God in him!" "Are you going to say that to my friend and brother-king? He'll enjoy hearing it, I'm sure." "The King of Ur-of-the-North cannot afford to lose the right to trade with Byblos, and the king of Byblos will not trade with someone that Pharaoh deems to be his enemy. This Terah's claim is in direct conflict with Pharaoh's authority." Abram laughed. "By this very action you prove that Pharaoh has no authority. God has never allowed human sacrifice. Never. It cannot happen. A father does not kill his son in the name of God. So by asking for this, you prove that you and your Pharaoh are the enemies of God." "We are the enemies of your god," said Suwertu. "I have a suggestion, Abram. Get out of Ur-of-the-North tonight, while you still have time. Because if you're here by morning, you will be taken and offered up as a sacrifice. Your father will, of course, be given every opportunity to raise you from the dead." Suwertu rose, bowed to Father, and swept from the house. Abram sighed. "I see that this marriage is going to cause political complications. Who would have thought Pharaoh would care so much." "It's not Pharaoh, it's his meddling priest," said Father. "You'd better leave, Abram. Give me time to work out the political problems." "Forgive me," said Abram, "but you have no lever that you can use to pry us out of this. If I leave, the marriage is off -- the king of Ur-of-the-North will be forced to bow to Pharaoh's will, because Byblos is more important to him than you are. I speak offensively, sir, but I speak the truth." "Your words sting," said Father, "but yes, it is the truth. So I release you from the marriage vow. Go. You can take the flocks with you." "On the contrary," said Abram. "I came here to seal the marriage promise between the daughter of a king of great and ancient lineage with the grandson and heir of another. Nothing has changed, as far as my errand is concerned, except some interference from the lying priest of a false god. What does this nonsense have to do with Lot and Qira?" "Didn't you hear him? He'll kill you." "There is more than one way for God to show his power," said Abram. "Just because Suwertu has a plan does not mean that the plan will be carried out." "And just because you trust in your God does not mean that God will regard your life as being important enough to be worth saving," said Father. "I trust in God," said Abram, "not to save me from death, but to save my soul when I die. I expect my father to see to it that the priest of Pharaoh does not shed my blood on an altar in order to perform some stupid test. God does not give signs to prove things to liars." "I think you are in grave danger," said Father. "I think you're right," said Abram. "But there are bears in the mountains, and lions on the savannah, and diseases that kill men in their sleep. Do you know why I can't die now?" "Why is that?" asked Father. "Because I promised Sarai that I would come back for her in ten years." Father's face reddened. "Sarai is promised to Asherah." "Asherah is just another name for mother Eve. She was a woman of greatness and nobility, but she was never a god, and she has no use for your daughter, except to see her be married and raise her children to serve God." "Are you trying to make me as angry as Suwertu?" "I speak truth," said Abram. "I speak the same truth to powerful men that I speak to weak ones. That's why you can trust every word I say. How many men do you know with whom that is possible? But now, if you'll excuse me, I must go and see to my other business in the city." "I hope you will have sense enough to leave Ur at once," said Father. "Next time have your father send a trusted servant, and not a son. Especially not such an honest and forthright son." Abram smiled. "My father has sometimes told me that nothing is more annoying than the inconvenient virtues of one's children. God be with you, King of Ur." In moments he was gone. Sarai was left gasping at all that she had heard. This man called into question all that she had been taught, all that she believed, and he did it with such authority that it was impossible not to listen to him. Even when Fatherglared at her and demanded what she did to allure this man, Sarai could only answer feebly, "I don't know, I don't know." For as of this day, she was no longer sure of anything. Except this: Abram said he would be back to marry her, and somehow it would happen, for today she had seen for the first time in her life the true power of a king. It was the word of power: To speak, knowing that the thing spoken would come true. The next few weeks were maddening for Sarai. Everything happening to Abram in Ur was important to her household -- and certainly not least to her! -- but no one thought to tell her each bit of news as it came into the house. Instead she had to quiz the slaves, who never quite got the story right, since they didn't understand it themselves, and also tended to change the details to make stories more interesting -- which usually meant more awful. But the truth, when she finally learned it, was awful enough. Because Suwertu declared Abram to be the enemy of Pharaoh's authority and therefore a danger to the authority of all kings, Abram was taken prisoner. Within a day, his father Terah came and camped in the grassland half a day's run from Ur. His messengers passed back and forth, trying to win Abram's release. Suwertu, though, was pulling strings behind the negotiations, and the choice became clear. Terah had to renounce his claim to the true priesthood, confess that Pharaoh was the only heir to the birthright of Noah, and swear never to make such a claim again. Otherwise, he could prove the power of his priesthood by raising his son Abram from the dead, after he was sacrificed to Ba'al -- or Horus, or to Pharaoh himself as a divinity, depending on who was telling the story. Until the gossip about Suwertu and Abram began, Sarai had never heard of offering a human being as a sacrifice. To her, worship was about incense and music, and now and then, from a distance, the ashy smell of burnt meat. But the meat was always an animal -- a bullock, a he-lamb -- and a year or so back, Qira had explained to her that only parts of the animal were burnt, while the rest of the meat was used by the priests. "What do you think they eat, silly?" asked Qira. But Sarai had never thought about it. She had only had some vague idea that the god they served provided for them. Instead it was the people. But when she realized that they were seriously planning to sacrifice Abram, her first terrible thought was that the priests would eat him. Qira quickly dispelled that notion -- but provided her with information that was even more horrifying. "It's not like anyone in Ur sacrifices babies to Molech." If she intended to reassure Sarai with this information, she failed. It broke Sarai's heart just to imagine that somewhere there were people who would kill their own baby -- and that they would do it in service to a god. And now that Abram had raised in her mind the possibility that priests might be making up some of the stories about the gods, she was even more confused. For she could not believe in the existence of a god who wanted the murder of children. Yet she could also not believe that a priest could make up such a terrible thing. Sarai thought of all the babies that she had known -- an infant suckling at a servant's breast, a toddler playing beside his mother as she worked. She saw how mothers loved their children, even when they were annoyed with them, even when they were angry. Though she didn't understand why the mothers got angry. Everything children did, at every age, fascinated and delighted Sarai. And somewhere, either a god or a priest decided that people should be commanded to offer their own babies as sacrifices. All of this preyed on Sarai's mind, and many times she almost convinced herself that it was all pretend, that nobody ever really killed people in the name of a god. Certainly it never happened with the worship of Asherah -- though there were things that went on at the temple of Asherah that they didn't talk about in front of her. Could it be that even there, something or someone was killed? Impossible. But the rising tide of gossip made anything seem possible. Now she heard for the first time that Suwertu had sacrificed a child as a thank offering, burning the child's body on a hill near Olishem. 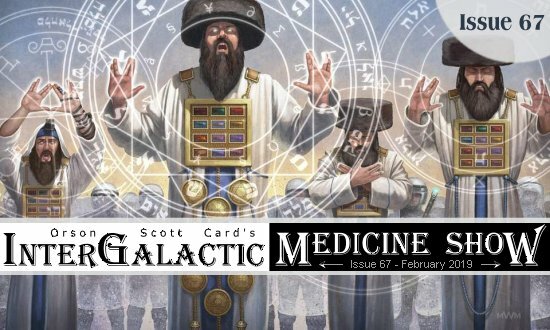 This story was told in support of the idea that there really wasn't anything unusual about human sacrifice, though to Sarai it seemed that if human sacrifice were normal, no one would need to prove that it was normal, because everyone would already know. Most of the stories horrified or puzzled Sarai. Only one really frightened her. It was the tale that Suwertu had sacrificed three young sisters. It wasn't the fact they were young like Sarai that made her afraid. It was that they were the daughters of a man named Onitah, who just happened to be making a claim that he was the rightful heir of the first Pharaohs. If this story was true, it meant that Suwertu made it a habit to kill people in order to punish their fathers for claiming the birthright of the priesthood. That was the reason this story was told -- those who repeated it always made comments about how murder was murder, even when a priest did it and called it sacrifice. "This has to be stopped," they would say. But Sarai never heard them mention any plan to stop the sacrifice of Abram. They might deplore it, but they weren't doing anything. Not even Father. And why? Because he was afraid that he might lose his safe haven in Ur-of-the-North if he spoke up against Suwertu's "sacrifices." This is how it happens -- how bad people can do terrible things, right out in the open, and everyone stands away and lets them do it. There were even people who were helping Suwertu. The priest of Shagreel, for instance, claimed that Abram had also blasphemed against his god, which was, after all, only the sun. By saying that only the priests of his father's God had authority, Abram had as much as said that all other gods were false. "And yet we see the sun in the sky every day!" the priest was said to have declared. "We are warmed by it! And Abram denies that the sun is a god!" At last Sarai could stand it no more, and went tearfully to her father to ask him why no one was doing anything. "But many of us are doing things," said Father kindly. "We do them quietly, where you don't see. But if it hadn't been for our intervention with the king, Suwertu would have pierced Abram's heart already." "So you're going to stop him?" "With so many jackals pulling at the deer, how long will it stay on its feet?" Father shook his head. "I'm sorry you have to know about such things." "Why don't people hate Suwertu?" "They do hate him. But they fear him more. So they don't stand against him." "You stand against him, Father! I don't care if he sacrifices me." "He couldn't sacrifice you," said Father. "You belong to Asherah." Only then did she realize -- if Father openly opposed Suwertu, it might be Qira on that altar, just like those three daughters of Onitah. So because they fear it happening to their own families, everyone will let this murderer have his way. And he does it all in the name of a god. It made Sarai ponder long and hard about the life she had been pledged to live, as a priestess of Asherah. If the worship of Ba'al or Osiris or Elkenah or Shagreel could be used as a mask for the murder of a foreign king's enemy, then which gods were genuine? Only Abram seemed to be acting out of faith instead of private advantage, and his God had no statues. His priests were herdsmen like Terah and Abram and Lot, who worked with their own hands instead of leading the washed and perfumed life of a temple priest. Will I have to become a liar and hypocrite like Suwertu in order to serve Asherah? Or are the priestesses somehow holier than the priests? Abram said that Asherah was just another name for a real woman, Mother Eve, who was not a god at all? Why then would she need priestesses? These questions rankled her and bothered her, getting all mixed up with her confusion about Abram's promise to marry her and her own feeling of rage and revulsion at what was being done to that good man. Finally a day came when she could stand no more of it. She set aside her distaff and ran up to the roof. Three servants were there spreading out clean clothing to dry, but she sent them away so she could be alone there. She knelt and raised her arms to heaven and prayed, not to Asherah or Ba'al, but to the God whose name she didn't even know. "O God, spare the life of Abram! If thou dost this miracle, O God, then I will know thou art the only true God, mightier than kings and false priests, and I will worship only thee forever. I will repudiate my promise to Asherah. I ask only the life of Abram. He doesn't even have to keep his promise to come marry me -- I know that a man can sometimes be prevented from keeping his word, however honestly given. I ask nothing for myself. Only save his life, and I will be thy servant in all things forever." Over and over she said the prayer. That night, as she slept, Sarai was suddenly awakened by a great shaking of the ground. Her bed bounced on the floor. She heard the roofbeam creaking above her, and ran from her room into the courtyard, so nothing could fall and crush her. The servants ran there, too, and Father, and Qira. Some of them had bloody knees because they had fallen when the ground shook so hard. And some had bloody heads or shoulders, because of tiles or bricks that had fallen on them. When the earthquake ended, no one would go back inside. It was common knowledge that God rarely shook the earth just once. So even though the night was not warm, they slept outdoors, servants lying down right among the royal family. Sarai stayed awake after most of them slept, but not because she was afraid. At first she wanted to see whether the servants slept in some vulgar manner that would explain why they were not allowed to sleep in the same rooms as the royal family. And when she satisfied herself that servants were no cruder in their sleep than the royal family, she used the time to pray. At last she did sleep, though only fitfully. No one slept deeply or long. She lay on her mat on the stones of the courtyard as the adults woke, speaking softly, repeating news of the city. The earthquake had broken down this house or that one; this person had been killed, or that one. The reports of disaster made Sarai imagine what it might be like to have someone in her own family killed by the shaking of the earth. Surely there could be no clearer sign that a god wanted you dead than to have him shake the earth to accomplish it. She listened with her eyes closed, so no one would realize she was awake and cease speaking plainly in front of her. So she heard the glorious news at the same time Father did. "Suwertu was on the hill where he does his sacrifice when the earthquake struck," said the breathless visitor. "The earthquake knocked down all the statues he had gathered there, shattering them all. And Suwertu was directly under the statue of Osiris, which fell on him and crushed him to death." Father gave one bark of laughter, and then composed himself. "I am sure the king of this city will have a day of mourning for this noble servant of Egypt. There will be weeping and wailing throughout the land!" "No doubt," said his visitor. "What about the sacrifice of my son-in-law's uncle?" asked Father. "They can't be going on with it, can they?" The visitor chuckled grimly. "Since his own chief god crushed him to death while he was preparing to conduct that very sacrifice, I think it's safe to say that no one else is at all interested in going ahead and daring the gods again. No, there'll be no sacrifices today. I hear that Abram has already fled the city and gone into the desert." "Yes, now he goes," said Father. "I tried to get him to do that days ago, but would he listen?" "If he had left when you told him to, Suwertu would not have been at the altar when the earthquake struck, and so he would not be dead, and so the human sacrifices would have continued." "He's the one who got people back into that kind of worship when he was nothing but a priest of Elkenah. He showed everyone the danger of giving any man the power to kill his enemies in the name of God. No, I think that when the next priest of Pharaoh is chosen, it will be carefully explained to him what he may or may not do without the consent of the king of Ur-of-the-North." "So," said Father. "It looks like my daughter's marriage will go ahead after all." "If you still want to marry your daughter to the grandson of such a weak man." Sarai perked up her ears. "It was not weakness for Terah to refuse to repudiate his own claim, even if it cost the life of his son," said Father. "It was great courage and faith. More than I have. For I would never allow my own child to be sacrificed, as Terah was doing, just for the sake of preserving my own estate." For the first time it occurred to Sarai: Isn't that exactly what you did, Father, when you pledged me to Asherah the day I was born? Then, condemning herself for even having such a thought, Sarai bounded to her feet and ran once again to the roof. Behind her she could hear Father saying, with an irked tone, "Was she listening the whole time?" On the roof Sarai fell to her knees to pray again. "O God of Abram, I know thou art faithful to thy true servant, Abram. So I will keep my vow. I will not give myself to the service of Asherah. How could I, when I know now that thou art the only true and living God. Thou, O Shaker of Earth, art my God forever. For thou hast heard my prayer. Thou hast spared the life of Abram." In the spring, Lot finally came in person and married Qira under the gaze of their fathers -- two kings without kingdoms. It was a joyful time, and Sarai was especially happy for her sister, for she was going to have everything she wanted: Lot seemed to be a kind man, he was even more handsome than Abram had been, and he promised to live in Ur for the near future, leaving his steward and servants with Abram out in the empty grasslands. For Abram did not return to Ur, even for the wedding of his beloved nephew. There were those in Ur -- especially priests of other gods who had joined their cause with Suwertu's -- who would never forgive Abram for having humiliated them. Never mind that what humiliated them was proof that there was indeed a God who did not want Abram murdered. There was too great a chance that someone would try to finish the job -- Abram would never enter Ur again. And I will never leave, thought Sarai. He will forget me. But I will never forget him. It took two years, but she finally persuaded her father that it wasn't a whim -- she was determined not to enter the service of Asherah. It was a delicate task, persuading him to release her from the vow, for by releasing her he was as much as confessing that he was not, in fact, king of anything, and so his daughter had no responsibilities to the gods. Father never quite admitted that openly. He found some pretext about Sarai's unreadiness or unworthiness -- Sarai did not care, as long as she did not end up bound into the service of a god in whom she no longer believed. The years passed. Sarai watched as her father tried to arrange this or that marriage, but always it was the bored son of a rich man trying to add some luster to a family that had no standing. Father tried to persuade her that each one was really a good husband, but in truth he was never even able to convince himself. By the time Sarai was eighteen, she had no idea what was going to happen to her. By her age, most women were already married. Almost every day Sarai was reminded of how well her older sister had married -- with Lot's wealth to back her up, she was head of a worthy household in Ur. But to Sarai, the prizes in Qira's household were the two little girls who, truth be told, saw more of their aunt than of their mother. Is this my destiny, Sarai wondered, to be a spinster living in my sister's house, tending her children and someday her grandchildren, always subservient, never to have a child of my own in my arms? The one thing she could not let herself think of was the man who had come from the desert so long before. Lot sent messages back and forth to Abram at least every week, and servants made the journey often. Sarai heard of every movement Abram made, each new encampment. He would be in the ruins of this or that city in Canaan, empty because all the years of drought and windborne dust had forced the people to flee to other lands. Or he would be selling cheeses in Akkad or wool in Babylon or leather in Ur-of-Sumeria, and the next month, south of the Dead Sea in Sodom or Zoar, he would be selling jewelry or clothing from Akkad, Babylon, and Ur. She heard of him trading along the Phoenician coast in cities like Tyre or Byblos, or north among the Assyrians or the Hittites or the Hurrians. Not once did Lot ever tell Sarai that Abram had so much as asked about her. Not once did she receive a letter or a message or a gift or even a glance from a servant that would tell her that perhaps her name had been mentioned in Abram's tent. And yet ... she knew he was a man of honor. He had said he would come for her. She had promised nothing to him. Yet even if his words were merely a jest with a child, it did not change this single fact: If he did come, she was determined that he would find her waiting, ready to be a good wife, ready to be the mother of his children. And she would never be like Qira, making him live in a city so she could wear fine gowns. No, she would live in his tent, travel when he traveled. If he came for her, she would go with him, and stay with him forever. If the ten years passed, and then an eleventh, and he did not come, she would never send word to him, either, nor give a hint to anyone, not even Qira, that she had waited for him. She would simply decide, then, what to do with the rest of her life. By then it would probably be too late for her to marry any other man. But having once known Abram, she could not be content with a lesser man, and apart from Lot, she knew of none that came close to being Abram's equal. Did it hurt her? Yes, there were times when she felt a pain so sharp that it was all she could do to keep her weeping silent and secret in her room. But then, in the midst of such suffering, she would remember: Abram told me the truth about God, and saved me from a life wasted in the service of false gods. I would rather have had that hour of truth with Abram than any other possible life in which I did not have the truth and never met that man. She would pray at such moments, and soon her heart would be lighter, and even though she had no sign from God that her future was being watched over, still she was content. She could wait to see what life would bring. It was a hot day in summer, the kind of day where there is no shade except indoors, and indoors there was no air that one could bear to breathe. No breath of wind -- the dust from travelers or animals moving on the roads would rise in a cloud and hang there, unmoving, settling so slowly that it seemed to be a brown-grey fog. Sarai could not remain inside, and in the courtyard there was so much yammering from the servant women that she couldn't think. The dust of the streets made the air unbreathable; she could not walk to Qira's house. So she took her distaff to the roof, and with a whitelinen hood over her head to give her shade, she spun, while thinking her thoughts and glancing out over the desert, over the city, over the nearly-dry riverbed. Would the drought, which had already consumed so many years that she had never known a season when the river ran full, finally do to Ur-of-the-North what it had done to the cities of Canaan? Was it going to kill the grasslands and turn them into desert like the rumored empty lands of the far south, where only sand covered the earth as far as the eye could see? And who is that coming from the driest part of the desert, raising dust so thick that he must have an army with him? Does no one else see this marauding army? Why are there no trumpets of alarm, warning of a raiding party of so many Amorites that they will swarm over Ur like locusts? Then they came near enough that she could see that it was not an army at all, but a huge herd of cattle and a vast flock of sheep. What Amorite would be mad enough to assemble such a large herd in one place? Where would they find grazing? If all these animals were sold at once in the markets of Ur, they would force the price down so low that the animals would have almost no value. Even Sarai knew that much about trade. On they came, and on, and on, and finally riders went forth from the city, and then the riders came back from the herd, and after a very short while there was talking and shouting in the streets and riders came to the door of Father's house and Sarai heard her own name being shouted down below in the courtyard, in the rooms of the house, but she did not need to be told anything, she already knew. Abram had come for her, and with a bride-gift so large that no woman in all of Ur would be able to claim that so much had been given for her. Father himself came to the roof and handed her a sealed wax-stick. "For you only," he said, and his eyes danced with happiness, for he had been worried about his younger daughter. Sarai tremblingly opened the stick and exposed the two waxen surfaces. Very little was written there. But it was enough. I am almost two years early, Sarai, but I can delay no longer. I wait for you outside the walls of the city, with a gift for your father but none for you except my love and my faith and my future, which I ask you to share with me forever. Sarai looked up from the stick. "Father," she said, "I think my husband has brought an inconvenient number of cattle and sheep for you to dispose of." "His message to me," said Father, "spoke of plans to divide this herd and take the animals to a dozen other cities, where they will be sold and the proceeds brought to me. My only fear for you, Sarai, is that your husband will be poor, having given so much to me. And yet the gift does not begin to make up for the great loss to me when you leave and the light goes out of my life." Sarai burst into tears and embraced her father. "He remembered," she said. "He remembered me." "No one, having known you, could ever forget you," said Father. "Many men have forgotten me," said Sarai, "and far more have never noticed me." "Abram noticed you," said Father. "And God has noticed Abram." "And God has noticed me," said Sarai. "Or I would not be so blessed, to go from the house of such a father to the house of such a husband." Two days later, under a canopy that shaded the bright calm sun of morning, she and Abram were married, with Father, Terah, Lot, and Qira looking on. She did not know what the future would bring, but because she was married to Abram, she knew that her life would matter, that the world would change and she would be a part of it. Really enjoyed my interview with Le Point POP about masterpieces of science fiction. Read it here. 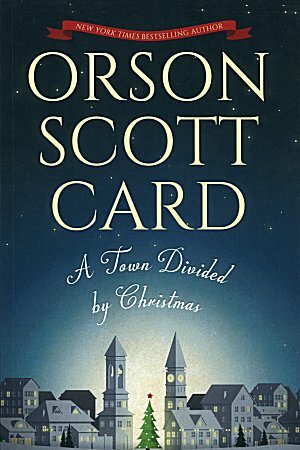 Orson Scott Card is once again partnering with Barnes & Noble in Greensboro NC to provide signed and personalized books for Christmas. 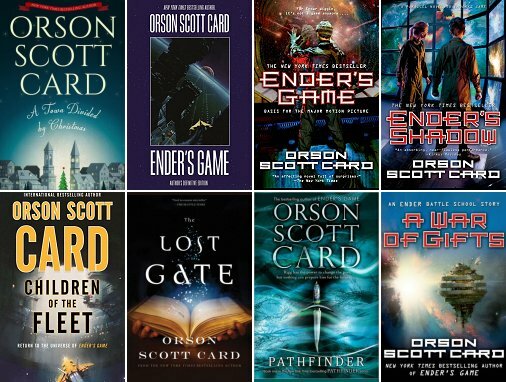 on the art and business of science fiction writing. Over five hours of insight and advice. Recorded live at Uncle Orson's Writing Class in Greensboro, NC. 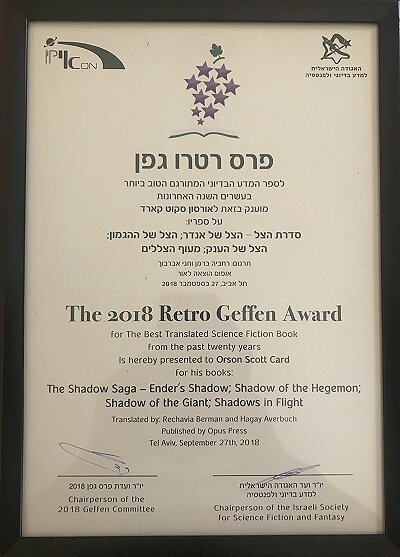 Thank you to the Israeli Association of Science Fiction and Fantasy for awarding a retro Geffen award to the Shadow Saga. Every now and then it's fun to talk about the nuts and bolts of writing! Copyright © 2019 Hatrack River Enterprises Inc.